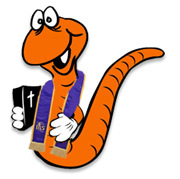 Additional editor "Wormy" thoughts: During our 2013 renovation of this forum, we 'found' this wonderful Bible Background from member Jane Kampion. As she notes, part of it was adapted from a previously posted lesson set. Some additional thoughts added by Wormy. Another editor notes: Jane has recently re-joined Rotation.org after a hiatus. We are glad to have her back! View a Science Workshop that Jane wrote. This background also reflects on the deeper meaning of "talents". What does God give us? What a great memory verse for this parable! I wonder if Peter was thinking of Jesus' parable when he wrote his letter? I'll bet so! Today when we talk about a “talented” person such as a musician or athlete, we are actually referring back to this parable. A talent in Jesus’ time was a valuable sum of money. A "talent" was probably a "weight" of gold or silver. Sources differ in how much a talent was worth. Some sources say about 2 years wages and others say 15 years wages. At any rate (pardon the pun) a talent was a large sum of money, but because of Jesus, the word ‘talent’ took on a different meaning, and so today we talk about the talents or gifts we have been given, which are like money we can invest and do things with. Jesus tells us that the kingdom of heaven is like this: A man (God) is going away on a journey. The man (who was very rich) calls his three servants and entrusts them with talents... large sums of money “each according to his ability”. Well the master certainly knew his servants because the two who had been entrusted with greater sums got straight to work and doubled this money for their master. The third servant, afraid to take a risk with even the smaller amount of money entrusted to him, digs a hole and hides it in the ground. The master returns, calls his servants before him and demands an accounting of the ‘talents’ entrusted to them. Now here's an interesting question: God knows which servant will probably fail the test. But he gives that servant the talent anyway! Even failure is an opportunity for confession and improvement. You have to ask yourself: WHAT IF the failed servant had confessed his sin? The two servants that doubled the money were highly praised and given more responsibility (and the privileges that come with it). That's strange: the servant was AFRAID of the Master. Are we so afraid of God that we do little? risk little? try not to make waves at school, at church, in the world? And why were the two other servants NOT afraid? What did they have that the failed servant didn't?? The master is furious with this account of his money. “You wicked, lazy servant!” he angrily replies, “So you knew that I harvest where I have not sown and gather where I have not scattered seed? Well then, you should have put my money on deposit with the bankers, so that when I returned I would have received it back with interest.” What happens next may be surprising to some. The master takes the one talent from the third servant and entrusts it to the second servant. “Everyone who has will be given more”, the master declares, “and whoever does not have, even what he has will be taken from him.” And with that he throws the third servant out of his presence and into the darkness. Why was the master so angry? And why is this like the kingdom of heaven? Of course, it's important to remember that this same God is a Good Shepherd. He makes sure the 99 sheep are safe, and then he goes out to find the lost sheep. The man was cast out, but like Adam and Eve and the Lost Sheep, God followed. God does not abandon. “No one received more or less than he could handle." If he failed in his assignment, his excuse could not be that he was overwhelmed. Failure could come only from laziness or fear or hatred toward the master. Why do YOU fail the Master? What is holding back YOUR faith? And how do you get over that? You have probably heard the expression, "USE IT OR LOSE IT." That is the same as Jesus’ message in this parable. It can be hard to hear that “to those that have much, even more will be given, and to those that have nothing, even the little they have will be taken away.” The message is that God entrusts us with our talents so that we will choose to use them, not just to hide them away. Jesus warns us not to hide our light under a bushel but to shine it from on top of the highest hill. God SAVES US. God FORGIVES US. But the parable also says that GOD WILL HELP US according to how well we respond to what he has given us. Using our Talents is about RESPONDING to what the Master has given us. Now imagine the gift was salvation, ...how do some people BURY the gift of salvation? How can you take salvation and invest/spread it around? Imagine the gift was forgiveness, ...how do you INVEST a talent for forgiveness in the world? Even ONE Talent was far more than a person needed to be considered rich. What would it mean to have FIVE talents of forgiveness? Ten!